Chennai: In a one of its kind punishment for disrespecting the National Honour, the Chief Medical Officer (CMO) at the Ambur Government Hospital in Vellore district has now been ordered by the Madras High Court to hoist the national flag every day for a week, salute it and also sing the anthem under police watch. The punishment comes along with the granting of the anticipatory bail to the doctor. 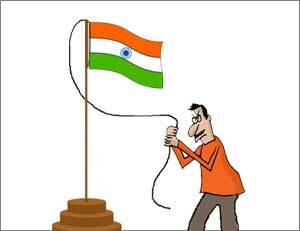 The punishment was given to the doctor after he was caught talking on the phone when the National Anthem was being played after the local MLA hoisted the national tricolor in the hospital on the occasion of Independence Day. The video of the doctor, soon went viral on the social media, following which a complaint was lodged against him under Section 2 of the Prevention of Insults to National Honour Act of 1971.
the petitioner shall hoist the National Flag every day at 10.00 a.m. for one week at the Government Hospital, Ambur and salute the flag and sing National Anthem and the respondent police is directed to monitor this and send a report to the Judicial Magistrate Ambur. The petitioner ( doctor) shall report before the respondent police as and when required for interrogation. The petitioner shall not tamper with evidence or witness either during investigation or trial. The petitioner shall not abscond either during investigation or trial. It is was ordered that fresh FIR under Section 229 A of Indian Penal Code be registered against the petitioner if he absconded after obtaining advance bail.